A dozen of us joined Simon Ginnaw for a walk in Mote Park on Sunday. The plan was to do some bird watching and as the sun set look for some bats. As many of you will already know Mote Park has been Simon’s local patch since he was 14, and his knowledge of the wildlife and history of the park makes for a fascinating walk. Our first stop was at a very old and extremely large sweet chestnut tree. This is reportedly 4-500 years old and it took five of us to “hug” the tree – the rough ruling is 100 years for each person it takes, so we were right on the mark with this one. Nearby a Turkish Hazel took our attention – not a species I have even heard of previously. As we wandered along we had time for some birding and starling, woodpigeon, magpie, crow and jackdaw were in our initial sightings, closely followed by goldfinch, chiffchaff and a rather distant mistle thrush. Great crested grebe were on the lake, and Simon pointed out where they usually nest – probably three or four nests had been successful this year. Simon spotted a hobby flying above us and as it circled we all had great views. As we learned more of the history of the park, a sparrowhawk was seen chasing a group of starling. Another large, veteran tree took six of us to circle so should be around 600 years old. The base of the tree was developing ganoderma fungi which is typical of old wood which is starting to decay. Simon showed us trees where little owl were know to roost, and area where up to 150 linnet are know to winter. A green woodpecker called, then flew over our heads. Robin, wren and a bullfinch were next to appear as we continued through the park – passing through an old yew wood which is known to be between 700-1100 years old. The area is believed to be a worship site for Celts and Druids. During the Second World War the army used the park and Simon pointed out areas where they had trained, camped and stored munitions. As we passed by the new Mote House which is now a development of residential properties, we had our first bat sighting, so it was time to start using the bat detectors. 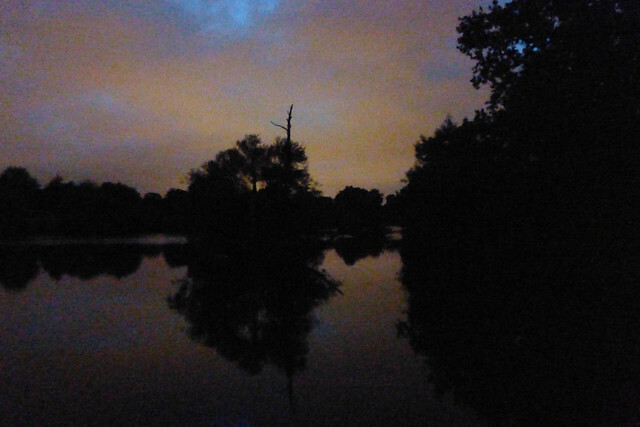 Common pipistrelle bat were first to appear, and as we walked along we also had soprano pipistrelle. 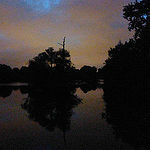 As darkness fell we neared the lake and over the water several Daubenton’s were seen in Simon’s torchlight. He was careful not to keep the light on for long, but just long enough for us to watch these lovely creatures feeding low over the water. The last species we saw and heard was noctule bat, by far the largest and with a great sound of ‘chip chop’ which made it easy for us all to identify. As the light faded we returned to the cars and home, having had a superb evening. Thanks must go to Simon for leading us with such passion and knowledge, bringing the park’s wildlife and history together. Thanks also to Paul and all those who attended and Julie for lending me her bat detector!